If you’re a prepper, you almost can’t have too many trash bags. In a long-term disaster with no garbage collection or utilities, trash bags will be essential for sanitation. But that’s not the only reason to stock up on them. As with several other items, there many things you can do with trash bags. Plus, they take up very little space, they’re lightweight, and they don’t cost much. For many of the uses listed below, the standard 13-gallon bags most people use in their kitchens will be fine. However, you should definitely get some large contractor bags. They are MUCH harder to tear, which is very important if you’re gathering water, patching leaks, building a raft, etc. Also make sure you have some duct tape and paracord. Now on to the list. Let’s get the most obvious one out of the way first. Trash bags are great for gathering things like fruit, vegetables, cans, bottles, or any other small items that could be useful. Put your clothes, food, water-sensitive gear, etc. in a trash bag in order to keep them protected from the rain. You could also seal your things in a trash bag while crossing a river. If you’re crossing a river or walking through a wet area, step into a couple trash bags and tie them shut against your shins. This will keep your shoes dry. Trash bags make great ponchos. Just cut holes for your head and arms and put it on like a shirt. You could also lay trash bags on the ground where you sleep to keep moisture from the ground at bay. After bandaging a wound, cut out an appropriate size piece of a trash bag and tape it over the bandage. This will keep it from getting dirty or wet. If you don’t have a belt or rope or anything else, twist up a trash bag and use that instead. It’s not ideal, but it could still save someone’s life. You can also use trash bags to tie a splint in place. However, you may have to use several of them to make sure it’s sturdy. If someone has a soft tissue injury with pain and inflammation, fill a trash bag with snow or ice, tie it shut, and use it as a cold compress. As long as the bag is large enough, it will work just fine. The method is the exact same as it would be if you used a large piece of cloth. Follow this link to learn how. Dig a hole in the ground and put the trash bag inside it. Secure the edges of the bag in place with heavy rocks, then wait for it to start raining. Put a rock in a clear trash bag and tie the bag over the end of a branch with lots of leaves on it. The sun will draw water from the leaves and it will pool around the rock. Learn more. These don’t collect much water, but they’re better than nothing if you’re desperate. Here’s a video of someone who made a solar still using a black trash bag. If there’s a lake or river nearby, use a trash bag to gather water and haul it back to your camp. You’ll definitely want the contractor bags for this so you don’t lose all your water because of a tear. If you don’t have any other type of container, you could store some water in trash bags. Or you could line water storage containers with trash bags to keep the water safer. Fill a black trash bag with water and hang it in the sunlight for a few hours. Once the water is warm, poke some holes in the bottom of the bag and you can have a warm shower. If you’re butchering an animal, cleaning up waste, helping someone who is bleeding, working in the garden, etc., you can use a large trash bag as an apron and use smaller pieces as gloves. If temperatures are low, you can tape trash bags around your legs, arms, and torso for some makeshift thermal underwear that will help retain your body heat. If you’ve been outside for a while and there’s no shade, you can tape together a few trash bags, stretch them out, and tie them to a tree for a temporary shade. In case you need an emergency shelter, you can use branches, cordage, and a 55-gallon trash bag. Here’s how. This takes much less space in your bag than a tent or tarp. Cut open the sealed end of a trash bag and use duct tape to attach it to the open end of another bag. Then use it like you would a sleeping bag. It will hold in your body heat and help you stay warm. Fill several trash bags with leaves, hay, or some other kind of stuffing and flatten them out to form a mattress. It’s not ideal, but it’s better than sleeping on the ground. Blow some air into a trash bag and tie it shut to make a nice pillow. Again, this is not ideal, but at least you won’t get a crick in your neck from sleeping without a pillow. As I said in my article about buckets, you can put some kitty litter in a trash bag, put the bag in a bucket, and use it as a portable toilet. Put some clothes in a trash bag and add some warm water and soap. Shake the trash bag for a while, then drain the soapy water. Now add some plain water and repeat the process to rinse the clothes. It could become necessary to quarantine someone who is contagious. In case this happens, trash bags and duct can be used to seal off a room. Read this for more information. If you’re concerned about drawing attention during a power outage, tape black trash bags over your windows so other people won’t see that you have lights in your home. If you have a leak in the roof or a container or anywhere water is getting through, trash bags can temporarily fix the problem. Some branches, cordage, and trash bags full of air can make a raft that can hold at least one person. Watch this video to see exactly how it’s done. If you don’t have time to build a raft, you could at least use a single trash bag full of air to keep yourself from sinking in deep water. Only do this as a last resort. Put clear trash bags over plants to protect them on freezing nights, keep them moist, or block the wind. Prop them up with some sticks so they don’t touch your plants, and don’t leave them on all the time. Line your garden with trash bags to stop weeds from growing. All you need are some heavy rocks to keep them from blowing away. Poke lots of holes in a trash bag to create a makeshift net, then stand in the middle of a river and catch fish as they come along. Double or triple bag your food to keep bugs out. To protect it from bears and many other wild animals, hang the bag high in a tree. Trash bags can be stretched over a flat surface and used as a plate. Another option is to put a bag in a hat or bucket and use it as a bowl. You can cut trash bags into long strips and braid them together to make a rope. You might be surprised by how sturdy it is. Cut white trash bags into strips and tie them to trees or whatever else you can find. As long as each one is within visual range of another, you or others will be able to follow a trail without getting lost. A white trash bag could be used as a flag you can wave back and forth. You could also use several rocks and black trash bags to spell SOS in large letters that can be seen from the sky. 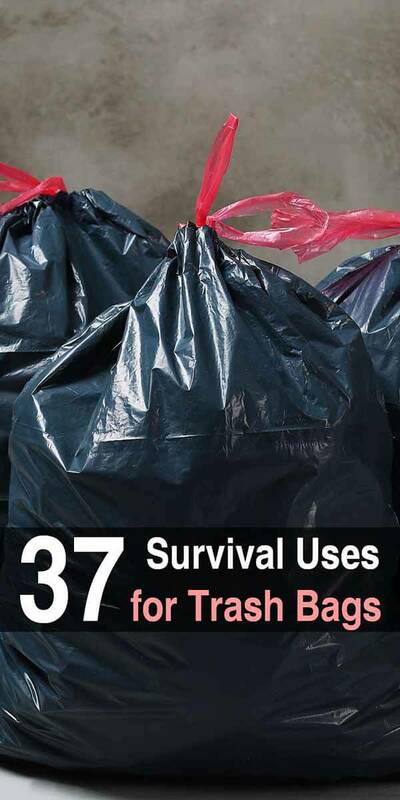 As you can see, a simple trash bag is one of the most useful items you can have, especially in a survival situation. Stone boil water. Good list!